100% Vegan. Sheer Matte Tint. New Formula. Made with a blend of certified organic oils, butters, waxes, Vitamin E and a hint of colour! An everyday essential! Get kissable, soft and supple lips! Perfect for that occasion when you just need a soft hint of colour while protecting and nourishing your lips! eg. at the gym, at the beach, jogging, at school, doing quick run to the shops, at home! I am big fan of tinted lip balms for days when I like my makeup to look a bit more natural. This is easily the best one I have used. I received the shade Happiness from beautorium and it contains a hint of pink. 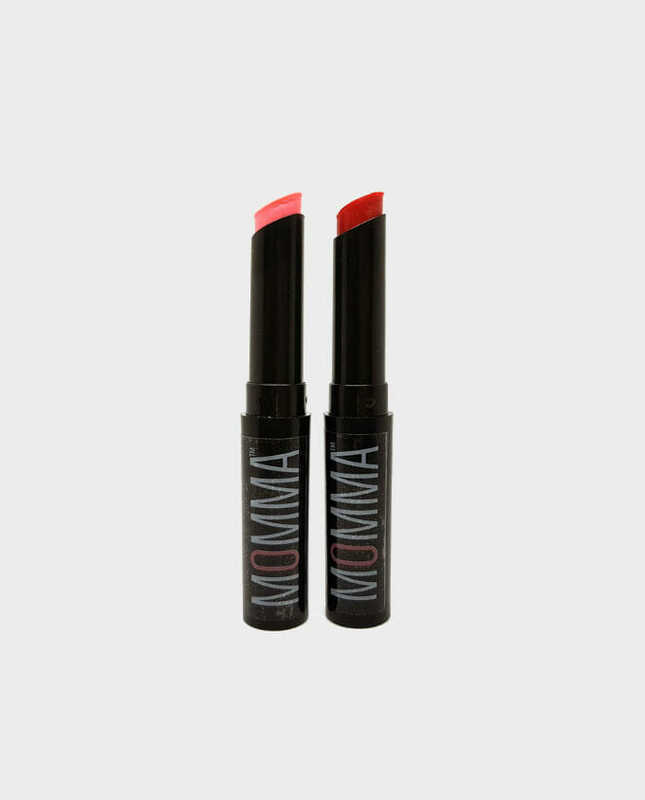 The texture is lovely, it glides on the lips and is very moisturising without being sticky. The shade of pink compliments my pale skin perfectly and it last remarkably well for a lip balm. Since using this I have gone on to purchase more Momma products and have been impressed with all of them. A great Aussie company with no nasties. I love this tinted lip balm by MOMMA. I am a no-fuss girl when it comes to lip products and this is definitely no fuss! I was drawn to this product when I read the description and mostly because it’s tinted – which means I get the lovely soft colour with the extra moisturising properties of a lip balm. I particularly love how natural this lip balm is. It is free from all the naughties and full of all the goodies, including certified organic oils and vitamin E. So my lips feel extra protected for quite some time. I carry this lip balm with me everywhere and since I received it in my Beautorium parcel, it’s the only lip product I’m using! I’ve never heard of this brand, but after being so pleased with the results of their lip balm, I think I will be buying more MOMMA products. And, it’s a steal at only $5!!!! I recently purchased a sample kit from Momma’s website and picked up 3 different shades of lip tint while I was there. These little lippies are great! They are really smooth to apply, give a lovely soft feel, and the colours pop! My lips feel silky and moisturised while wearing them, I always keep one in my bag to apply while I’m out or at work. I took off a star because of the packaging, one of mine wound up but wouldn’t wind back down again so I have to gently press it down with my finger. Despite that, I still love the lip tints and would definitely repurchase. At only $5 each they are well worth the money! I love these as I’m more of a lip tint girl rather than lipsticks. These are so amazingly moisturising and have such beautiful colours, some are more sheer than others, and I love the names so uplifting, love and joy are my favs. Back when I purchsed there were only four shades would love if they came out with more. Yes the colour is very subtle and doesn’t last very long but the moisturising effect does and I love the way it feels so reapplying this is something I don’t mind doing just as you would with any other lip balms. Really moisturising! I love using this everyday to give my lips a nice tint of colour and makes them look healthy.